Good movies inspire the kind of conversation which make afternoon walks seem airy and timeless. Especially through the charming neighborhood of Chamberí, past its old-fashioned bars and its streets full of madrileños going about their Sunday routines. We had just seen Woody Allen´s latest film “Midnight in Paris” with José and Juani, a Spanish couple in their 40´s who have never missed a single good movie. Speaking of being transported to the past, the nostalgia of previous epoques, a city whose heart in its younger times sparked a special and intimate fondness that is sometimes difficult to revive… Jose talked about a Madrid that was his, some twenty-odd years ago, when he first moved here in his youth. He also talked about the desire to write, which in his younger days was something so essential and yet whose flame is unsustainable these days in his life as a family man. Put out by a lack of inspiration, by the greater necessities of adulthood. The balance that living life with another person can give you, so that the alone-ness, the melancholy doesn’t urge itself anymore onto paper. How did you two meet? I find that that is always an interesting question. One day 26 years ago, Juani randomly caught a train to Aranjuez with some friends, where José was living at the time, a grungy teenager with long hair and a rebellious soul, like all teenagers. He was lounging around the streets with his friends that Saturday afternoon. Juani and her friends asked his group of friends for sight-seeing suggestions around the city. They walked around together, had a coffee, and became immediate friends. Before Juani departed on her train to Madrid, they exchanged mailing addresses. I always find it difficult to imagine these past encounters; the images are always lit with a movie director’s videocamera, the hairstyles and clothes and actions are all props created for the spectator, who never will have seen this moment. Their friendship continued with letter writing, long letters with multiple pages, back and forth between Madrid and Aranjuez. José was a writer and idealist. He believed in this singular necessity. Lord how times have changed…even in my days as a kid I still received handwritten letters and postcards in the mail, I sent cards and parodies of newsletters to my best friends, I kept everything safe in my small world of shoeboxes and drawers. Now we hardly have time to respond to emails, and the pressure of speed defeats the purpose of snail mail. I’m on a mission to keep handwritten pages alive, and traveling. 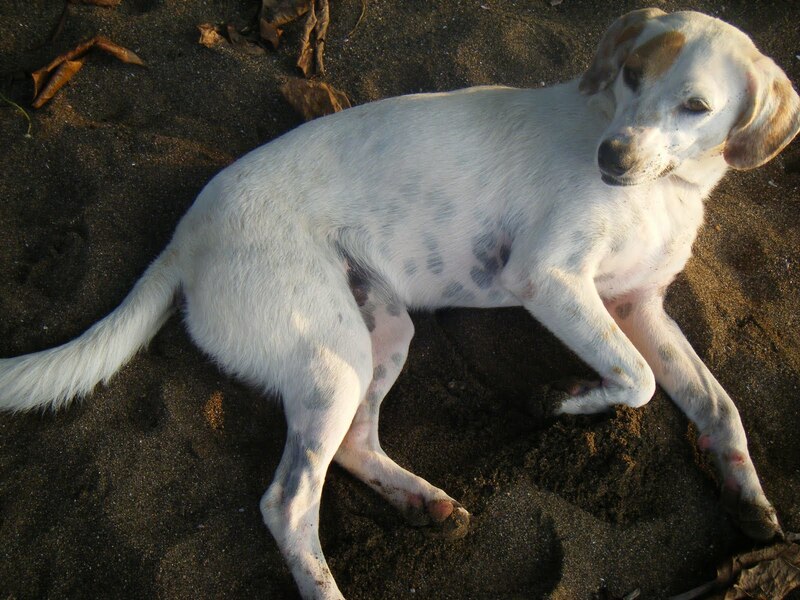 Before I start blogging in depth about our adventures in Costa Rica, I must first tell you about the dog of my dreams, who I met on the shores of Drake Bay, a gorgeous and remote paradise where we stayed for five days. 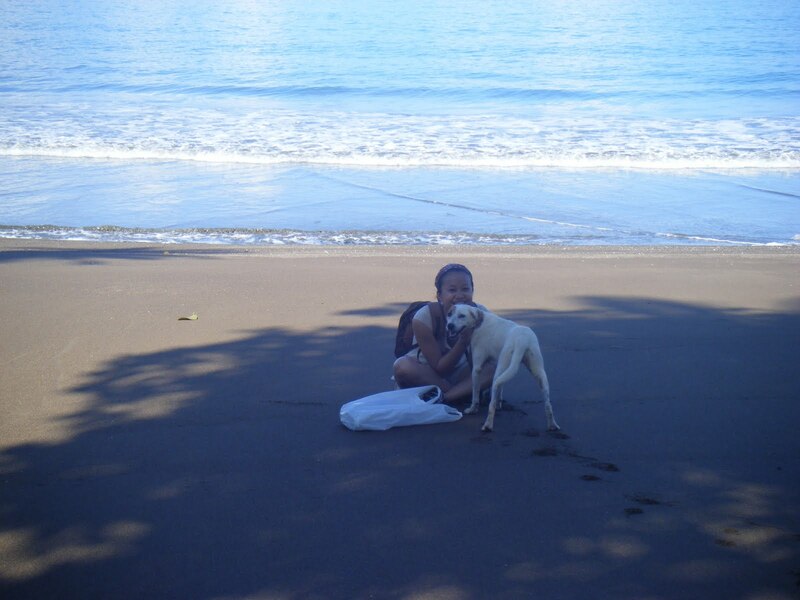 We met Mancha while walking along the beach towards the rainforest path. 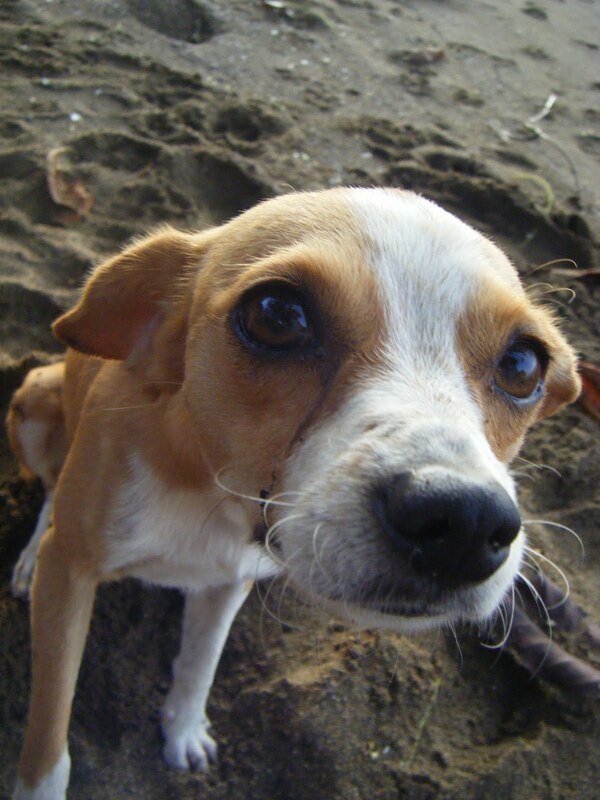 She was strolling and sniffing around the sand and decided to come over and say hello to us. After I petted her a couple times, she began following us and became our guide through the forest trails. She would stop and wait for us each time she went ahead, seeming for all the world like an extremely intelligent and happy little person. After trekking along a lush and quiet forest trail (and spying a tucan in the trees), we stopped at a beach called Cocalito: beautiful, tiny, and all to ourselves at 8 in the morning. 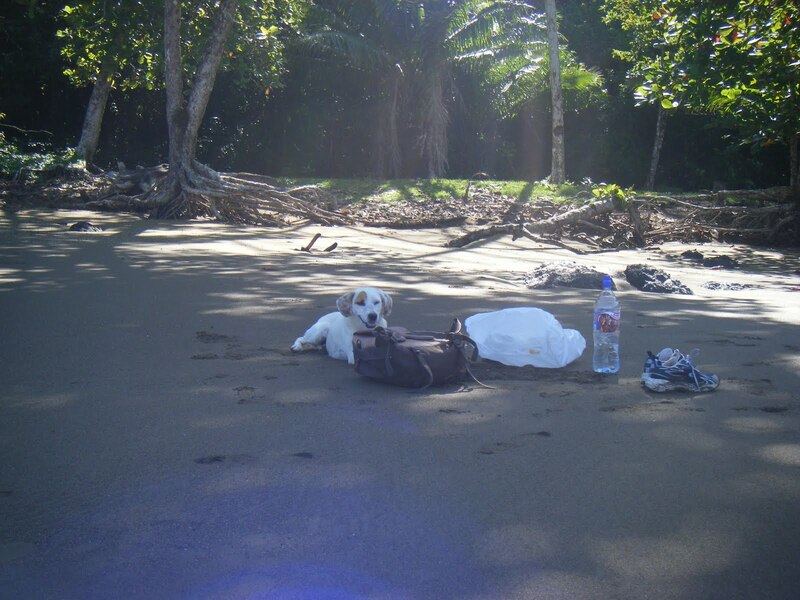 Mancha settled down in the shade with our bags and clothes while we played in the waves. On our way back to the bay, we encountered mischievous cappuccino monkeys on the path. 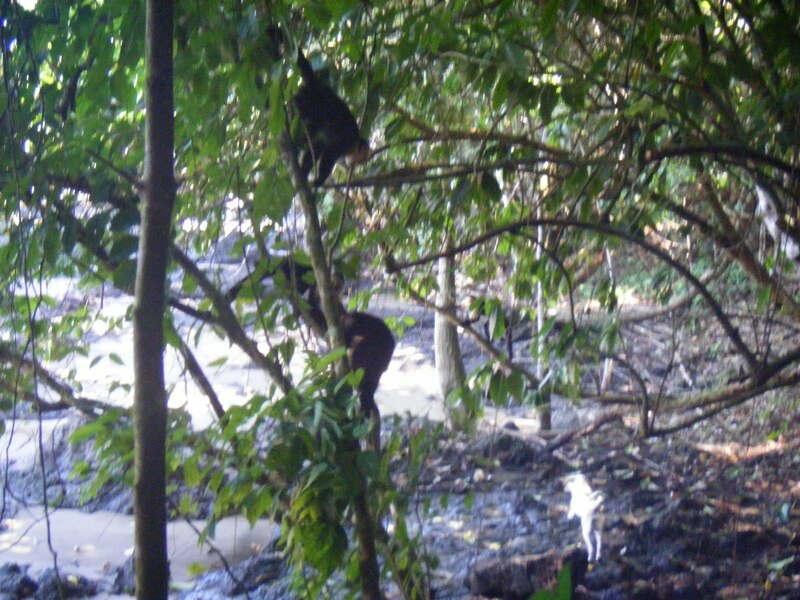 The dogs began barking at them, and suddenly at least ten more monkeys appeared, bouncing and scurrying around in the trees making screeching noises at the dogs. It was quite the show-down. 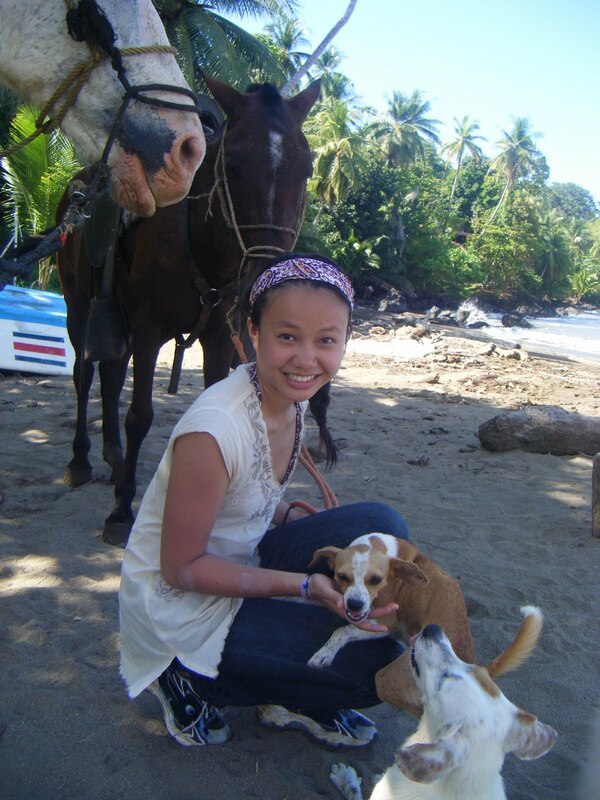 The dogs followed us all the way back to the bay, where we departed on our horse-back riding trip to the waterfall. When we came back later in the afternoon, there they were again, meandering on the beach like lost orphans. The day before we left the bay, we decided to go back to Cocalito for a last swim. And who did we encounter but the two of them mosing around again on the bay? When we called them, their faces lit up with joy and they came running towards us for sloppy kisses. We fed and watered them when we got back, but the dogs there don’t seem to eat much. They hung around for awhile under chairs until it was bedtime. 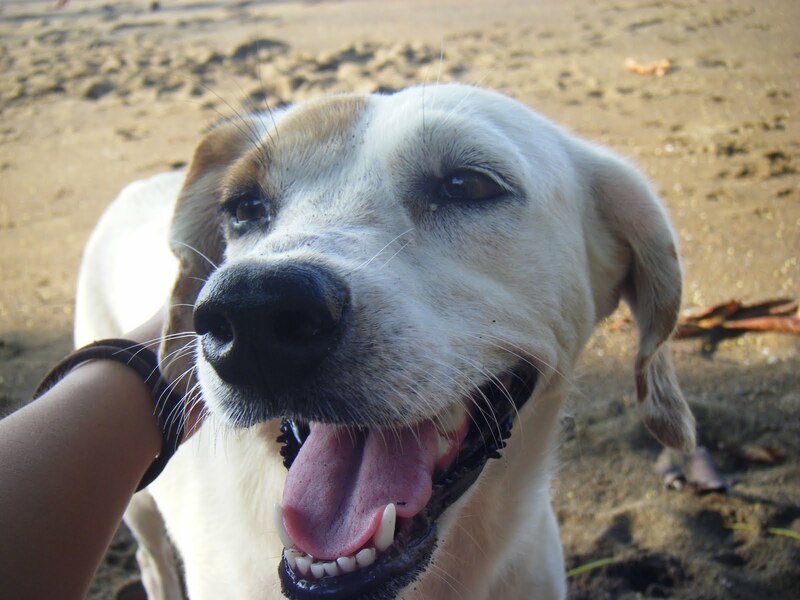 I would have taken Mancha back with me if she didn’t already have an owner… But at the same time, what dog would want to trade that kind of free-roaming paradise for the freezing cold civilized world of Madrid?